Riley was a Multi Class In Group and In Show Winner at All Breeds and Specialty Shows. He won under Local, Interstate, Overseas and Breed Specialist Judges. 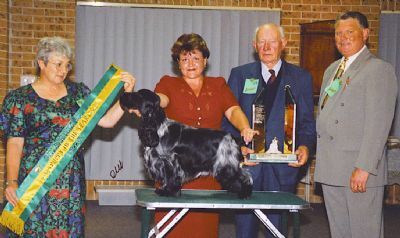 He titled with ease and was the Winner of "Puppy Of The Year 2003" for The Cocker Spaniel Society of NSW Inc. He was the sweetest boy and just loved the show ring rain, hail or shine! especially rain!! !